A photo illustration shows the photo-sharing app Instagram's fan page on Facebook's website. 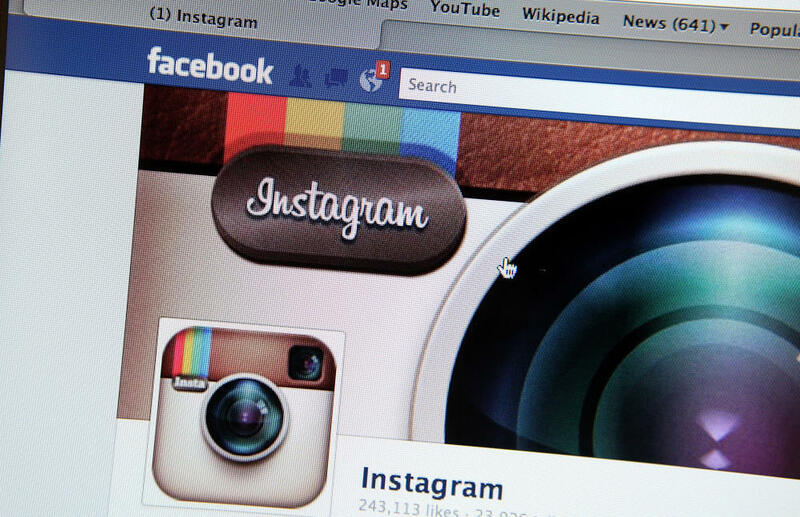 Facebook is acquiring Instagram for some $1 billion. 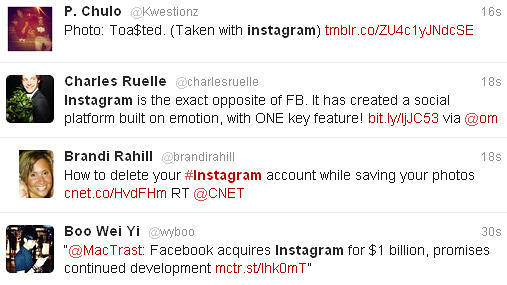 A sampling of Twitter users' response to the news that Facebook is purchasing Instagram for $1 billion. Within a few hours, interest spiked in Instaport, a service that allows Instagram users to export their photos as a zip file. On Twitter, many Instagram users said they were already in the process of deleting or uninstalling the app. The negative response came despite efforts by Facebook CEO Mark Zuckerberg to assure Instagram users that they would keep "the ability to post to other social networks, the ability to not share your Instagrams on Facebook if you want, and the ability to have followers and follow people separately from your friends on Facebook." In the first three hours after his post to his Facebook profile, Zuckerberg's post about the Instagram deal had received 98,000 "likes." One commenter said the combination was "Like putting peanut butter and chocolate together!!!" But others disagreed. And an article on Mashable cited Instaport as an option for unhappy Instagrammers — while listing other options, as well, such as Copygram (which was unavailable for part of Monday afternoon, presumably from high server load) and Instagrid, which you might need if you delete your account and still want to keep tabs on your favorite Instagrammers. And on Hashgram, a site that sorts Instagram's artfully filtered images according to topic, many users who tagged images with "Facebook" were using it to express their displeasure. In fact, it seems that the high volume overwhelmed the site's search abilities, because while dozens of images were returned as a result soon after the deal, a "Facebook" search at 4 p.m. EDT got an empty "No results found" page. Other searches also returned the same result. But the searchinstagram site was still working — and it showed that many users had uploaded images that ranged from the merely informational to the excited to the sarcastic: One image riffed on the Instagram logo while renaming it "Instabucks," while several others used Facebook's own "thumbs-down" logo. The news of Facebook's purchase comes less than a week after many Instagrammers were last outraged — by the opening of their arty-photographic redoubt to users of the Android mobile OS. Some who had been using the service since it debuted on Apple's iOS treated the Android app's arrival as a calamity and an opportunity to channel their inner 1-percenter, as Cult of Mac's review of dismissive tweets showed. One message was starkly simple: "Instagram just got a whole lotta ghetto." In others, users swore they would not allow Android users to follow them. It's still early days (or, actually, still Day 1) in the Facebook-Instagram deal, but some of those disgruntled users might want to visit Venture Beat, where an article from this afternoon lists "5 alternatives to Instagram for Facebook haters." Or they may want to just take a deep breath, and see what Instagram will look like under Facebook's ownership. On Twitter Monday, some folks sought to put the deal in a broader perspective. One tweet came from Harvy Matharu (@Harvym), who was one of many to reference a common theme: "So Facebook bought Instagram for $1 Billion. Idiots! They could have downloaded it for free." And The Wall Street Journal's Dennis K. Berman (@dkberman) wrote, "Remember this day. 551-day-old Instagram is worth $1 billion. 116-year-old New York Times Co.: $967 million." Back in February, NPR's Steve Henn wrote about Facebook's upcoming IPO — and Steve noted that one of the huge social networking site's few weaknesses was its mobile effort. As Steve wrote, "Roughly half of Facebook's users check in on mobile devices every month, but so far the company isn't making any money on mobile." Many are seeing the Instagram deal as Zuckerberg's effort to allay those concerns and to keep other social media services from encroaching on Facebook's turf. On Read Write Web, Jon Mitchell writes about how "Facebook Buying Instagram Makes Perfect Sense," in which he cites Facebook's status as a photo-sharing destination, and Instagram's smartphone-friendly social network. It is, Mitchell says, "a natural fit." The other main risk facing Facebook ahead of its stock offering, Steve wrote, is the challenge of balancing its users' desire for privacy with its advertisers' need for exposure. And from the early reaction to the Facebook-Instagram deal, it seems that an effort to bolster one of those areas — mobile — may have raised fears on that other front: privacy. If you're an Instagram user, do you think the acquisition is a good deal, or are you worried about about a drop in Instagram's quality — or concerned for your privacy, if your social profiles are held under the same roof?